Reverse kiss-cut means all layers line up on the outer edge and go down like stairs along the inside. Alright, so to recap with the new information. That looks like something Super Mario should be jumping over. Ah, an excuse to post this. Shouldn't it have been Mario from Super Mario World instead of #3? That was the one that had the Koopas on the fences in the castles. 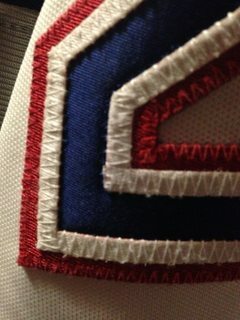 So, any other thoughts on the Habs? Very unoriginal to name yourself after something as general as the country you play in. it's hockey, everyone is a Canadian!!! Excuse me, sir, but the reigning Hart Trophy winner is a MURICAN thank you very much. OK, new question: what material did the Blackhawks use for the nameplates on the 2014 SS jerseys? I just bought one (since it's the only outdoor game jersey they've won in) from JB today and I'm probably going to ship it to CSL immediately to be done up as a Toews. And we have an answer courtesy of bobbyp6565's 1999-2000 Canadiens gamer. That assumes, of course, that there was no switch of the number construction between the 99-00 and 00-01 seasons. New question before I call Custom Crafted and get a quote for my three Bruins: what's the proper material to use for a Pro Player nameplate? I've got a Pro Player Pooh Bear (albeit a replica) and I'm guessing that much like my Koho black jersey, it'll need to be sent to CC. ProPlayer replica jersey material is very different than their authentic material. The unique texture of the replica material, coupled with the unusual color of the Pooh Bear means you're not likely to find matching nameplate material unless you cut up another replica. Even if you do find matching material, it's not the same as the authentic material anyway, so the term "proper" material, for a replica, doesn't really have any meaning in regards to accuracy. EPS may have the correct material. They have both red and white Pro Player material, that I can tell you from experience. If you're referring to the flo-knit material, yes they have that, but I'm talking about the replica material, which is very different. Yeah i'm a big Hawks fan. And yeah I missed the word "replica". I doubt anyone will have that and LAK's advice is spot on, you're gonna have to obtain a sacrifice. That being said, you only need to match the color, not the jersey. I think your Pooh is yellow. First, see a doctor. Second, I don't know if any other team during the Pro Player era was using yellow. Unless, you ask in the Nameplate thread if anyone already has some, you may be pleasantly surprised. Happened to me with my 2002 ASG, someone had the exact material in almost the exact size I needed. Those guys over there are chopping stuff up on the regular. By chance, would you happen to have a picture of the PP authentic material? I'd really like to see how close it is. There's a good close up of the nameplate on this gamer. I only had a PP replica one time for a very short while, but by my recollection, its not even close to the same as the authentic material. That authentic material looks suspiciously similar to Nike Flo-Knit. Was PP owned by Nike? No but SP made the jerseys for Nike and I believe PP as well so the material is the same flo-knit.